Kotter puts it very well, ” Management is about making sure the system runs in the organisation; whereas leaders choose and design the management system that the organisation needs”. In “Reinventing management”, Julian Birkinshaw writes about alternative ways to choose how to manage organisations. 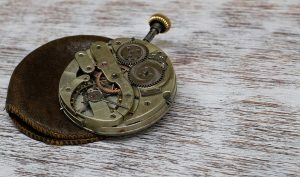 Jim Collins talks about leaders as either time tellers or clock builders; the latter designing the system and looking after the health of the organisation, long-term. They adapt and redesign that system as the environment changes. Are you a clock builder? Or just a time teller? How we manage is clearly a choice. These approaches clearly tell us that how we choose to design our systems and ways of managing and then manage our organisations, is clearly a choice we are making. The problem with early generations of the balanced scorecard approach and systems is that they assume a system of management. They assume various models of strategy. In many cases they assume various strategies. They assume that measures motivate and targets drive behaviour. They assume we want alignment and cascading objectives and measures. They assume that the organisation structure, is top down. They assume particular business and service delivery models. They assume a model of management that was popular 20 years ago. Not only is the management model assumed, it is implicit in the model of traditional balanced scorecard approaches. So, if you set out to implement a typical third generation balanced scorecard, there is every chance it might clash against your existing management model. It was this realisation that helped me to recognise the significance and importance of a shift to the Fourth Generation Balanced Scorecard approach. It was the experience of talking to clients for whom their “balanced scorecard” project had failed that helped me realise where they were going wrong: They were failing to recognise that they had created a clash of different management systems and management cultures. Their failure to recognise that, meant a failure to explicitly manage the changes, and their projects crashed, or failed to have any of the deeper impact they wanted. They needed more flexibility in how they choose their systems and ways of working. The fourth generation balanced scorecard takes a different approach. In the Fourth Generation Balanced Scorecard approach, we explicitly look at the systems of management. First you have to understand how the systems of management work today and the problems that are being encountered (or the changes desired) . For instance, how you think about strategy and manage that strategy determines how you approach the initial design phase and the conversations you want to create. How do you currently manage with your various performance management systems? Are they working together and having the desired effect? How you choose to create and manage the culture of motivation influences how you think about whether to even have targets, how those targets might be developed, by whom and any consequences associated with the target achievement. How are decisions made, taken and acted upon? Do you cascade the strategy, in a top down approach? Or do you develop the strategy bottom-up or inside out? Are you aligning the organisation or creating the space for people to perform? Are you applying control or encouraging learning? Is this about purpose and meaning for your people, or clear objectives and targets? Does your organisation work inside its organisational boundaries, or does it connect to a wider network that makes it work? These are just some examples of the contrasting styles of management that can exist. What are the implications of different management styles, approaches and systems. The trick is to make explicit what management system changes you are planning. The trick is to understand how the existing management system is working, what might be wrong and how you want to fix it. If you are to change the management system, then you have to be clear what you are trying to achieve and how that change will ripple through to other parts of the system of management. You have to make that decision explicit in the design and implementation of the approach. Fail to do that and it will crash on the rocks of culture, eating strategy for breakfast. Our experience is that by explicitly adapting your 4G Balanced Scorecard approach to the systems of management you are wanting, you are far more likely to achieve the changes you want and that those changes will be embedded. After all, such projects are significant change programmes. Failing to recognise that will lead to an unsuccessful change and a failed project. Explicitly recognise these changes and you are on the way to a change in culture, behaviours and an improved system of management. Making those changes explicit is a core part of the generational shift in the 4G Balanced scorecard approach. To find out more you can follow the various links, or simply get in touch for a conversation about your organisation.